Map of America by Jonghe, c. 1770. The population of the Americas is made up of the descendants of eight large ethnic groups and their combinations. 1. The Indigenous peoples of the Americas, being Amerindians, Inuit, and Aleuts. 2. Europeans, mainly Spanish, British, Irish, Italian, Portuguese, French, Polish, German, Dutch, and Danish people. 3. Mestizos, those of mixed European and Amerindian ancestry. 4. Those of Black African ancestry. 5. Mulattoes, people of mixed Black African and European ancestry. 6. Zambos (Spanish) or Cafusos (Portuguese), those of mixed Black African and Amerindian ancestry. 7. Asians, that is, those of Central, Eastern, South, and Southeast Asian ancestry. 8. Those from the Middle East (Middle Easterners). 9. Amerasian, those of mixed, usually European, and Asian ancestry. The nations of Guyana, Suriname, and Belize are generally considered not to fall into either Anglo-America or Latin America due to lingual differences with Latin America and geographic and cultural differences with Anglo-America; English is the primary language of Guyana and Belize, and Dutch is the primary language of Suriname. Spanish – spoken by approximately 320 million in many nations, regions, islands, and communities throughout both continents. English – spoken by approximately 300 million people in the United States, Canada, Jamaica, Trinidad and Tobago, The Bahamas, Bermuda, Belize, Guyana, and many islands of the Caribbean. French – spoken by approximately 12 million in Canada (majority 7 million in Québec—see also Québec French), and Acadian communities in New Brunswick and Nova Scotia); the Caribbean (Haiti, Guadeloupe, Martinique); French Guiana; the French islands of Saint Pierre and Miquelon; and Acadiana (a Francophone area in southern Louisiana, United States). Quechua – native language spoken by 10–13 million speakers in Ecuador, Peru, Bolivia, northern Chile, and northwest Argentina. Haitian Creole – creole language, based in French and various African languages, spoken by 6 million in Haiti and the Haitian Diaspora in Canada and the United States. Guaraní (avañe'ẽ) – native language spoken by approximately 6 million people in Paraguay, and regions of Argentina, Bolivia, and Brazil. Italian – spoken by approximately 4 million people, mostly New England / Mid-Atlantic in the United States, southern Ontario and Quebec in Canada, Argentina, and Brazil, and also includes pidgin dialects of Italian such as Talian (Brazil), and Chipilo (Mexico). German – Some 2.2 million. Spoken by 1.1 million people in the United States plus another million in parts of Latin America, such as Brazil, Argentina, Chile, and El Salvador. It is the second most studied second language in the United States. Aymará – native language spoken by about 2.2 million speakers in the Andes, in Bolivia and Peru. Quiché and other Maya languages – native languages spoken by about 1.9 million speakers in Guatemala and southern Mexico. Nahuatl – native language of central Mexico with 1.5 million speakers. Also was the language of the Aztec People of Mexico. Antillean Creole – spoken by approximately 1.2 million in the Eastern Caribbean (Guadeloupe, Martinique, Dominica, Saint Lucia) and French Guiana. American Sign Language – An estimated 100,000–500,000 people within the Deaf Community use ASL as their primary language in the United States and Canada. Mapudungun (or Mapuche) – native language spoken by approximately 440,000 people in Chile and Argentina. Navajo – native language spoken by about 178,000 speakers in the Southwest U.S. on the Navajo Nation (Indian reservation). The tribe's isolation until the early 1900s provided a language used in a military code in World War II. Dutch – spoken in the Netherlands Antilles, Aruba, and Suriname by about 210,000 speakers. Miskito – Spoken by up over 180,000 Miskitos. They are Indigenous people who inhabit the Caribbean coast of Nicaragua and the easternmost region of Honduras. Pennsylvania Dutch – Some descendants of the Pennsylvania Dutch in the Northeast U.S. speak a local form of the German language which dates back to the seventeenth and eighteenth centuries. They number about 85,000. Inuit – native language spoken by about 75,000 across the North American Arctic and to some extent in the subarctic in Labrador. Danish – and Greenlandic (Inuit) are the official languages of Greenland; most of the population speak both of the languages (approximately 50,000 people). A minority of Danish migrants with no Inuit ancestry speak Danish as their first, or only, language. Cree – Cree is the name for a group of closely-related Algonquian languages spoken by approximately 50,000 speakers across Canada. Nicaraguan Creole – Spoken in Nicaragua by up to 30,000 people. It is spoken primarily by persons of African, Amerindian, and European descent on the Caribbean Coast. Garífuna (or Garinagu) - native language spoken by the Garífuna people who inhabits parts of the caribbean coast of Belize, Guatemala, Honduras and Nicaragua. The vast majority of them live in Honduras. Welsh – In Argentina, two towns of Trelew and Rawson were settled by Welsh immigrants in the late nineteenth century and the Welsh language remains spoken by about 25,000, including the towns' older residents. Cherokee – native language spoken in a small corner of Oklahoma, U.S. by about 19,000 speakers. The use of this language has rebounded in the late twentieth century. It is known to possess its own alphabet, the Cherokee syllabary. Gullah – a creole language based on English with strong influences from West and Central African languages spoken by the Gullah people, an African American population living on the coastal region of the U.S. states of South Carolina and Georgia. While many in the United States of America generally refer to the country as America and themselves as Americans, many people elsewhere in the Americas resent what they perceive as misappropriation of the term in this context and, thus, this usage is frequently avoided. In Canada, their southern neighbour is seldom referred to as "America", with the United States, the U.S., or (informally) the States used instead. English dictionaries and compendiums differ regarding usage and rendition. Citizens of the United States of America are normally referred to by the term estadounidense instead of americano or americana. Also, the term norteamericano may refer to a citizen of the United States. This term is primarily used to refer to citizens of the United States, rarely those of other North American countries. In Portuguese, the word americano refers to the whole of the Americas. But, in Brazil and Portugal, it is widely used to refer to the citizens of the United States. Sometimes norte-americano is also used, but americano is the most common term employed by people and media at large, while norte-americano (North American) is more common in books. The least ambiguous term, estadunidense (used more frequently in Brazil) or estado-unidense (used more frequently in Portugal), something like "United Statian" or "estadounidense" in Spanish language), and "ianque"—the Portuguese version of "Yankee"—are rarely used. América, however, is not that frequently used as synonym to the country, and almost exclusively in current speech, while in print and in more formal environments the US is usually called either Estados Unidos da América (i.e. United States of America) or only Estados Unidos (i.e. United States). There is some difference between the usage of these words in Portugal and in Brazil, the Brazilians being less prone than the Portuguese to apply the term América to the country. A well-known example of such use is the translation of the title of Alain Resnais' movie "Mon Oncle d'Amérique": "O Meu Tio da América". In French, as in English, the word Américain can be confusing as it can be used to refer either to the United States, or to the American continents. The noun Amérique sometimes refers to the whole as one continent, and sometimes two continents, southern and northern; the United States is generally referred to as les États-Unis d'Amérique, les États-Unis, or les USA. However, the usage of Amérique to refer to the United States, while technically not correct, does still have some currency in France. The adjective américain is most often used for things relating to the United States; however, it may also be used for things relating to the American continents. Books by United States authors translated from English are often described as "traduit de l'américain". Things relating to the United States can be referred to without ambiguity by the words états-unien, étasunien, or étatsunien, although their usage is rare. In Dutch, the word Amerika almost always refers to the United States. Although the United States is equally often referred to as de Verenigde Staten or de VS, Amerika only extremely rarely refers to the entire continent of the Americas. There is no alternative and commonly used Dutch word for the Americas. Therefore, in order to stress that something concerns the Americas as a whole, Dutch uses a combination, namely Noord- en Zuid Amerika (North and South America). 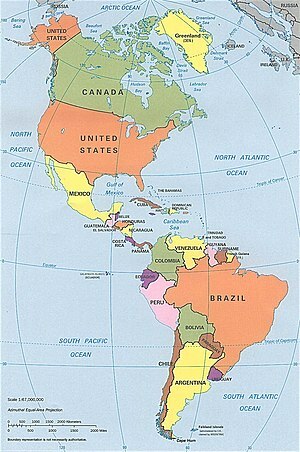 Latin America is generally referred to as Latijns Amerika or, less frequently, Zuid Amerika (South America). The adjective amerikaans is most often used for things or people relating to the United States. There are no alternative words to distinguish between things relating to the United States or to the Americas. Dutch uses the local alternative for things relating to elsewhere in the Americas, such as Argentijns for Argentinian etc. Map showing the dates of independence of the countries of the Americas. Black shows areas not independent. ^ america - Definition from the Merriam-Webster Online Dictionary. Retrieved on January 27, 2008. ^ america. Dictionary.com. The American Heritage® Dictionary of the English Language, Fourth Edition. Houghton Mifflin Company, 2004. http://dictionary.reference.com/browse/america (accessed: January 27, 2008). ^ Brian C. Story (28 September 1995). "The role of mantle plumes in continental breakup: case histories from Gondwanaland". Nature 377: 301–309. doi:10.1038/377301a0. ^ Land bridge: How did the formation of a sliver of land result in major changes in biodiversity. Public Broadcasting Corporation. ^ David S. Whitley and Ronald I. Dorn (1993). "New Perspectives on the Clovis versus Pre-Clovis Controversy" ([dead link] – Scholar search). American Antiquity: 626–647. ^ Canadian Inuit History. Canadian Museum of Civilization. ^ Vinland. Canadian Museum of Civilization. ^ The Norse settlers in Greenland - A short history. Greenland Guide - The Official Travel Index. ^ Russell Thornton (1997). "Aboriginal North American Population and Rates of Decline, c.a. A.D. 1500 - 1900" ([dead link] – Scholar search). Current Anthropology 38: 310–315. doi:10.1086/204615. ^ Alfred W. Crosby (April 1976). "Virgin Soil Epidemics as a Factor in the Aboriginal Depopulation in America". David and Mary Quarterly 33: 289–299. ^ Henry F. Dobyns (1993). "Disease Transfer at Contact". Annual Review of Anthropology 22: 273–291. doi:10.1146/annurev.an.22.100193.001421. ^ George C. Hurlbut (1888). "The Origin of the Name "America"". Journal of the American Geographical Society of New York 20: 183–196. doi:10.2307/196759. ^ Charles Burress. "Romancing the north Berkeley explorer may have stepped on ancient Thule", San Francisco Chronicle, June 17, 2004. ^ South Georgia and the South Sandwich Islands, Antarctica - Travel. ^ Appalachian Mountains. Ohio History Central. ^ Natural History of Quebec. ^ Strategy. Amazon Conservation Association. ^ SRTM SOUTH AMERICA IMAGES. ^ Greatest Places: Notes: Amazonia. ^ Great Rivers Partnership - Paraguay-Parana. ^ Now Bolivia Can Do Windows. ^ Bambi B. Schieffelin; Rachelle Charlier Doucet (February 1994). "The "Real" Haitian Creole: Ideology, Metalinguistics, and Orthographic Choice". American Ethnologist 21: 176–200. doi:10.1525/ae.1994.21.1.02a00090. ^ Mike Gasser. A3 Languages cited in this book. ^ American Indian & Alaska Native Heritage Month: November 2003. United States' Census Bureau. ^ a b c "America." Oxford Guide to Canadian English Usage. (ISBN 0-19-541619-8) Fee, Margery and McAlpine, J., ed., 1997. Toronto: Oxford University Press; p. 36. ^ "America." Microsoft Encarta Dictionary. 2007. Microsoft. "Americas". Encyclopædia Britannica, 15th ed. 1986. (ISBN 0-85229-434-4) Chicago: Encyclopædia Britannica, Inc.
* Territories also in or commonly reckoned elsewhere in the Americas (South America). Beautiful photographs of the Tower of the Americas in San Antonio and breathtaking views from its observation deck.